But recent years have seen conflict, particularly over land and in 2000 Mugabe instituted a policy of land reform that resulted in the seizure of white-owned farmland. With the landowners gone and no workable system in place, food production dropped, the agriculture industry faltered, and Zimbabwe suffered an economic crisis. Meanwhile, the economy of Botswana, Zimbabwe’s neighbor to the east, is comparatively strong. As a consequence, many Zimbabweans have tried to emigrate to Botswana, one of the wealthiest economies on the continent alongside South Africa. 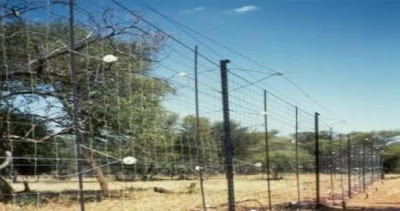 In 2003, the government of Botswana announced plans to build an electric fence along the border with Zimbabwe. The official reason for the fence was to stop the spread of foot-and-mouth disease among livestock. Thousands of cattle have been slaughtered in Botswana over the last few years because of successive waves of the disease. This loss is particularly significant in a country where cattle farming is the second largest source of income after diamond mining. However, the Zimbabwean authorities, say the fence is to prevent Zimbabweans from crossing illegally into Botswana.